One year has already dashed by since the Astrobase Kickstarter was successfully funded. We’ve achieved much since May 26th, 2017. Performance has improved, the characters are smarter and than they were, conversations and tasks have been fleshed out to better select the character’s personalities. We’ve taken down The Great Space Beast: Save Games (that took a lot of laser harpoons, let me tell ya, Earthling). We’ve made great friends on our discord channel, where we’ve received outstanding feedback to make the game better. We launched a Patreon. Most importantly, we’ve added a valuable new member to the team, which has allowed us to increase the pace of development. None of this would have been possible without all of you, so we want to extend our deepest gratitude for being part of this grand adventure. This week I’ve been working on making some less than pretty graybox UI’s we’ve had in for a while (the info panels) look more attractive. They’ve been a bit of an eyesore for a while so this should make playing the game feel better. Additionally (and in conjunction with the info panels) I did the art-pass on the upcoming overview info panel that Dave has been working on, which will make it much easier to get an overview (surprising huh?) of what the crew is up to as a whole. All in all, these changes should make things better for the players. Oh! 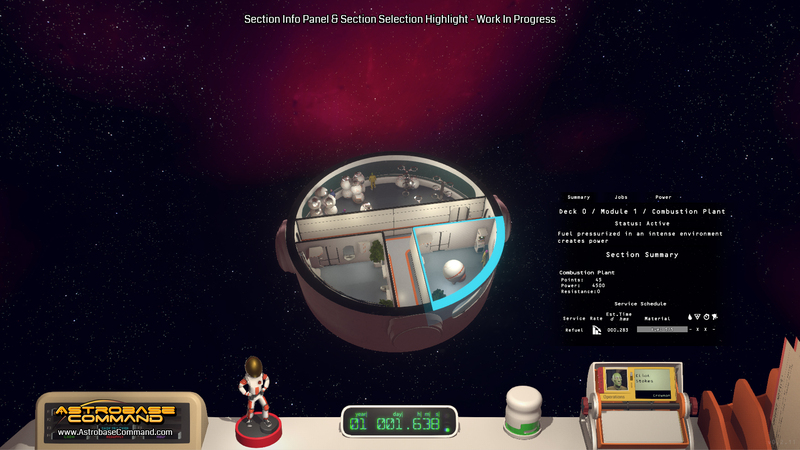 I almost forgot, I’ve been working on a new style of highlighting the current selection, for now the new style only works on the hovering and selection of sections (rooms). And while it’s something that is at it’s earliest iteration (or I guess technically it’s the start of the second distinct iteration) it feels pretty good to click on sections now. This week I’ve been full speed ahead on the RPG aspect of the game. This sits on top of the station/resource simulation, so characters get into RPG-ish situations that are driven by rational cause-and-effect or choice-and-consequence. This is a meaty design, that represents a large chunk of whats remaining before launch. So be prepared to hear a lot about it over the next few weeks! 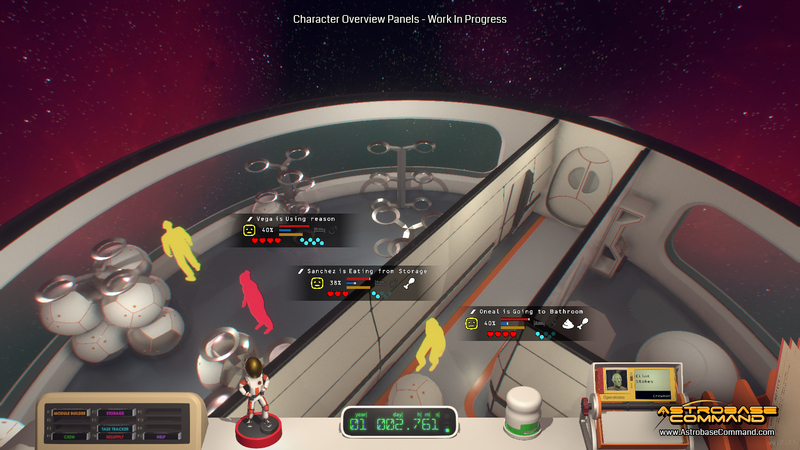 This week I focused on getting the updated UI elements to work (they look great and really clear things up! ), as well as getting some overdue admin out of the way. Cam and I broke down Dave’s combat design (PEW PEW!) into manageable chunks to prototype. I also modified several icons to make then compatible with Daniel’s new overview panels.